At the crossroads of three continents, Europe, Africa and South America, in the heart of the Cape Verde islands, Le Ponant, the company’s emblematic yacht that has been sailing the world for nearly thirty years, sails by Le Champlain, the latest jewel in the PONANT EXPLORERS series, that recently left its shipyard in Sovik, Norway, on 27 September 2018. One is the guardian of a secret heritage known only to her guests and the sea. The other has a promising future as a pioneer for great explorations. Past, present and future meet in this symbolic moment for the company. Two routes, two destinations, but a shared destiny. 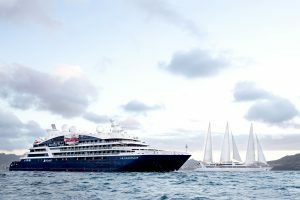 “This is a very powerful image for the company, telling its entire story in one photograph: our beginnings and our future, a combination of the maritime tradition that is so important to us and the cutting-edge technology, elegance and audacity that allow us to continue to pursue our dream,” said Jean Emmanuel Sauvée, PONANT CEO.